Remarkably after only 4 (admittedly onion heavy) meals, we have reached the end of our £2 sack of onions. 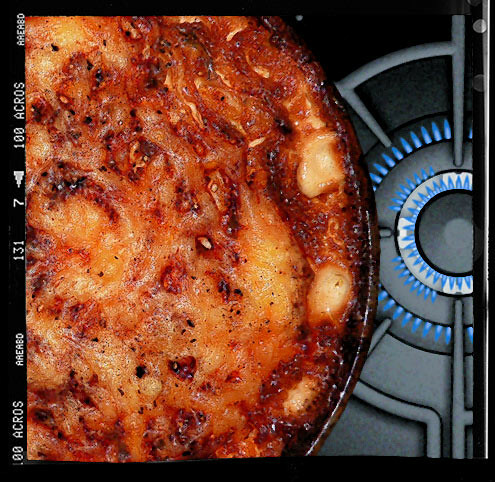 On this occasion they were consenting adults in a cheeky extramarital foursome with potatoes, cream and cheese – resulting in this very rich and even verier delicious gratin. Place the thinly sliced potato into a saucepan of salted cold water and heat until it starts to boil. Immediately it reaches this boil remove from the heat, drain and set aside. Meanwhile, heat the butter in a large sauté pan, add the onions, bay leaves and salt and cook for 10 minutes until the onions are soft and beginning to colour. Add the cream, nutmeg and cayenne and bring back to a simmer. 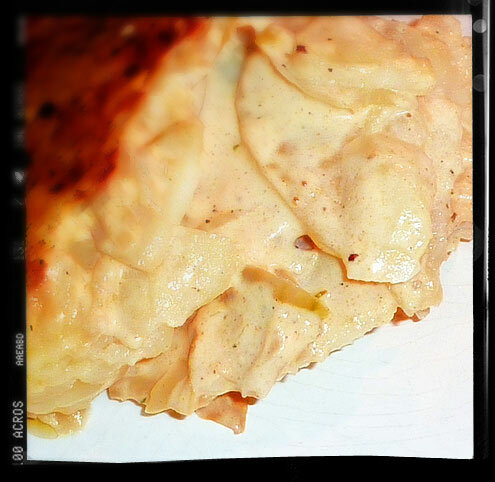 Find a suitably sized gratin dish and rub with butter. Line with some potatoes and pour over some onion sauce. Continue to layer in this manner, ending up with the onion sauce on top. Sprinkle with Emmental and bake in the oven for 45 minutes. Verdict: Rich, rich, rich, rich. Delicious, delicious, delicious, delicious. Drink: A few cold lagers before and a bottle of red during. Entertainment: Tucking into the third season of ‘Homicide – Life on the Street’. A slight shifting of characters (possibly a bad career move by Daniel Baldwin), but still as good as ever. If you’ve never seen H-LotS, watch this short clip.